Swiss Agents Gabi Mueller and Eric Hofstadler find themselves in Paris in the midst of its liberation from Nazi occupation and get swept up in the revolution occurring around them. Having thought that they were only travelling to the city to distribute medical supplies on behalf of the Red Cross, they’re soon informed that they’re required for a more important mission – rescuing the Mona Lisa before Reichsmarschall Göring gets his hands on the priceless painting. Along with Collette, an employee at the Louvre, and Bernard, her communist revolutionary boyfriend, Gabi and Eric set off across France in a race to get to the painting and transport it to a safe location ahead of Göring’s agents. Events don’t go entirely according to plan, and soon human lives are at stake as well as the painting, and Bernard has a hidden political agenda that not even Collette knows about. Chasing Mona Lisa contains far more than just the story of how the Mona Lisa was almost stolen by the Nazis. The downfall of the Nazi party and the corruption that existed among its ranks; the jubilation and dejection of French communists as they help to liberate France then realise that their efforts will not be recognised; the ways in which common men and women in France were manipulated into giving the Nazis crucial state secrets in order to protect their families are all presented in such a way that suggests that the authors had put a lot of effort into researching this novel. But as pleased as I was with the in-depth historical details that this novel contained, it took a while for the plot to shift its focus from the events unfolding in Paris in 1944 to the race to rescue the Mona Lisa. There’s no doubting that Tricia and Mike have done their research into the liberation of Paris, but I did start this novel thinking I was going to be treated to a detailed account of how Göring tried to steal the Mona Lisa. If I’d known that this book would have been so focused on other historical details I wouldn’t have minded, but Chasing Mona Lisa was definitely promoted as a novel about the Nazi’s attempt to steal the Mona Lisa. It’s not so much that I feel cheated; more that this book sells itself short as it contains far more than a potential reader could guess. It’s not just that the story is slow to start, since a lot does happen in the opening chapters. Gabi and Eric arrive in Paris when the city is on the cusp of liberation from the Nazis, and they and the other main characters encounter various events that would likely have been typical of Paris at this time. There are some excellent descriptions of particular sights in the city that made it all the more easy to visualise the experiences of the characters. But, and this is a big but when you consider the title of this novel, no one actually talks about stealing the Mona Lisa until a hundred pages into the book. I’d waited nearly a third of the novel for the painting to be more than briefly mentioned in conversation and was incredibly relieved when Göring finally reveals his master plan. Another slight flaw in this novel is that it jumps between the perspectives of all the major characters, including the Swiss agents, Collette and her boyfriend, Göring and another Nazi officer, and even the agents Göring pays to steal the painting. A lot of time is spent attempting to introduce these characters at the start of the novel but by the point the plot finally switches to the Mona Lisa I didn’t feel as if I really knew any of the characters, just that I’d spent a lot of time reading build up to what I presumed was the actual focus of the novel. I feel compelled to mention a couple of other aspects of the novel that didn’t sit quite right with me. These may merely be matters of personal preference, but I’m sure that other readers will have had the same reactions. I’m not big on violence, even if I’m reading a crime novel or thriller. 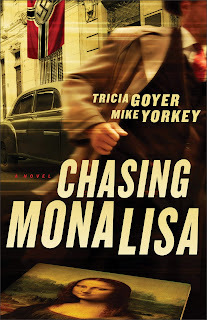 Naturally, it’s hard to write about WWII without including instances of violence, but I felt that those featured in Chasing Mona Lisa didn’t have to be quite so graphic. In particular, there was one scene that involved garden shears that wasn’t terribly tasteful. The liberation of Paris was a tough time and regular men and women did have to defend themselves against rogue soldiers who were only thinking of themselves, but I wish that some of the descriptions hadn’t been quite so graphic. A good writer can depict the gist of a scene without resorting to blood and gore. On a similar vein, this book is marketed as a Christian novel from a Christian publisher, yet aside from a few fleeting and awkward references to Gabi’s father attending church and thinking of his congregation, I couldn’t find anything in the novel that made it seem more suited for Christian market over the secular one. I generally prefer my novels to have a subtle Christian message but sadly there wasn’t anything resembling one in this book. I suppose it could be considered Christian in the sense that it’s a “clean” novel – no sexual descriptions or foul language, although some readers may find the violent scenes unsettling. But other than that, I was a bit disappointed with the lack of spiritual matter, particularly as Tricia has shown herself to be very adept at delving into the spiritual lives of her characters in her Big Sky series. Again, this is a matter of personal preference and the story isn’t at all spoiled by the lack of spirituality, but I do believe it could have been enriched by it if the authors had wished to include the spiritual journeys of their characters alongside the physical journey they took to rescue the Mona Lisa. I had high hopes for Chasing Mona Lisa, and while I was slightly disappointed, I think this has more to do with the fact that the synopsis and title of the novel sell it for something less than it truly is. Tricia and Mike have crafted a highly-detailed novel that is about far more than just the Nazi’s attempt to steal the Mona Lisa, and historical fiction fans will definitely appreciate the image they depict of the liberation of Paris in 1944. Christian historical fiction fans, however, may find the novel lacking in any sort of spiritual matter, which raises the question of what makes a novel more suitable for the Christian market than the secular one. Review title provided by Revell. Thanks, Gwen and Mike for your insightful comments! I think that what makes a novel "Christian" or not is an interesting topic to discuss, and I appreciate you both taking the time to read my review. Rachel: thank you for your thoughtful comments. Yes, "Chasing Mona Lisa" is not overtly Christian, but it is redemptive, meaning the "good guys" in the story (Gabi and Eric) act in a manner that is trustworthy and above-board. I thought having Gabi or Eric calling out for God's help at some point in the book would've seemed forced. In fact, Tricia and I went back and forth on this. Plus, things were happening rapidly with the Liberation of Paris, a lot of life-and-death moments . . . it's a good discussion that we're having. At the end of the day, I didn't want readers' eyes to roll but I did want readers to know that Eric and Gabi (and her father, Ernst, who played a very minor role in the novel) were godly people doing what was right. "Chasing Mona Lisa" is a stand-alone novel, but it is also a sequel to "The Swiss Courier," which would probably make you feel better about the route we took. The creative process isn't easy. You wouldn't believe all the work it took to stitch together the plotline of "Chasing Mona Lisa."